Bacon Ranch Pasta Salad is a family-friendly side dish Ranch lovers will swoon for. It features pasta salad coated in a quick and easy Ranch dressing (homemade or store-bought), crispy bacon, and more! Pasta salads are only as good as their dressings — lucky for us, this one is smothered in Ranch dressing, so all of your flavor bases are pretty much covered here. When it comes to the Ranch dressing, you have a few options: You can make it from scratch (don’t worry — it’s very simple), use a Ranch packet, or grab yourself a bottle of quality Ranch dressing from the grocery store. 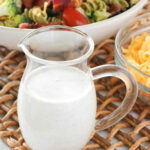 WHAT’S IN HOMEMADE RANCH DRESSING? Making a great Ranch dressing from scratch for your pasta salad is a very simple to-do. 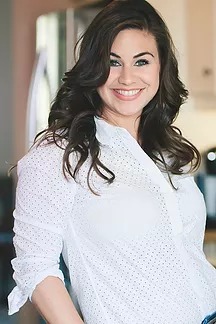 You’ll need mayonnaise, milk, vinegar, and dried spices and herbs like dill weed, chives, garlic powder, onion powder, along with salt and pepper. This recipe calls for rotini pasta. The intricate shape of the noodles allows for dressing to seep inside of its crevices and keep it in place, making for a very flavorful bite. Garden variety rotini is often used for pasta salads and will add an additional burst of color to your dish. Other pasta’s you could use for pasta salad include farfalle (bowtie pasta), macaroni, orecchiette, and even penne. 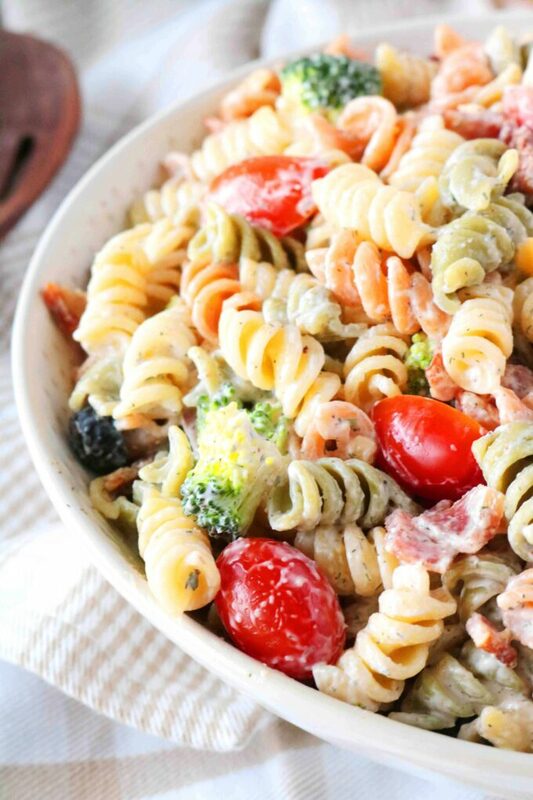 Bacon plays an important role in this pasta salad…it is Bacon Ranch Pasta Salad after all. But, aside from that, you can be as choosy as you’d like with the remaining ingredients. If there is an ingredient you don’t particularly care for, feel free to omit it and customize the salad completely to your liking. Combine pasta, bacon and other salad ingredients in a bowl and dress with half the Ranch. Refrigerate until chilled, 2-3 hours. Stir in remaining dressing just before serving. If you are making the Ranch dressing from scratch, do this first and refrigerate it until ready to use. While the thick-cut bacon is getting crispy on the stovetop, have that salted pasta water already coming to a boil. Use the time it takes for your water to boil and for the pasta to cook to prepare your add-ins: Chop the broccoli, halve the tomatoes, drain the olives, and grate the Cheddar. Once the pasta is cooked, it is strained and placed under cool running water. This will help to cool it down faster (which will help keep the cheese from melting when added) and rinse away some of the starches so the pasta doesn’t get too sticky. Then, add the pasta to a large bowl, along with the remaining salad ingredients and only half of the Ranch dressing. WHY ADD THE RANCH IN SEPARATE ADDITIONS? Pasta has a tendency to soak up sauces. This is one of the many reasons it’s so great leftover! However, in the case of Bacon Ranch Pasta Salad, you want a nice, creamy bite with every fork-full. If the pasta soaks up all of the Ranch before you serve it, this will certainly not be the case. Adding half of the dressing to the pasta before it goes to the refrigerator will ensure some seriously flavorful noodles, and adding the remaining dressing at the end ensures a creamy bite. It’s the best of both worlds. 4 MORE PASTA SALADS YOU’LL LOVE! Greek Pasta Salad featuring bowtie noodles, cucumbers, tomatoes, Kalamata olives, and Feta cheese is the perfect make-ahead potluck recipe or light lunch idea. Basil Pesto Pasta Salad is a creamy pesto pasta salad, made fresh and healthy with ingredients like grape tomatoes and green beans. Antipasto Pasta Salad is a zingy make-ahead pasta salad loaded with fresh Mozzarella, Sopressata, artichokes, and roasted red peppers. 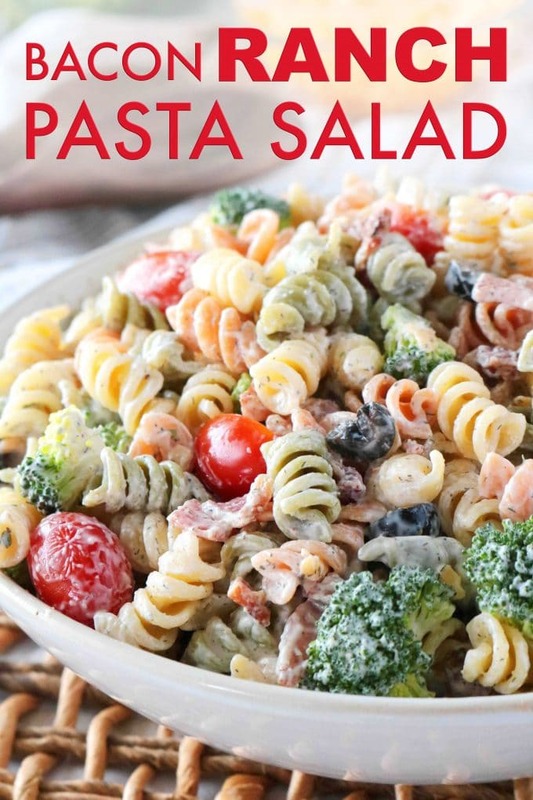 Kid-Friendly Pasta Salad is perfect for feeding little ones! With tortellini pasta, peas, green beans, and Cheddar, you’ll find this one is just as popular with the grown-ups. LOVE RANCH? HERE’S 4 MORE RECIPES YOU NEED. Bacon Ranch Potato Salad is the perfect potluck party side dish, made with pan-seared, thick-cut bacon and freshly grated Cheddar. Homemade Ranch Dressing is quick and easy to make with this simple mix of mayonnaise, sour cream, minced garlic, spices, and herbs. Easy Bacon Cheddar Ranch Dip is an addictively delicious dip, featuring a creamy ranch base, diced bacon, and shredded Cheddar cheese. Cheesy Bacon Ranch Potatoes is side dish no one could deny! No dressing, no packet required. 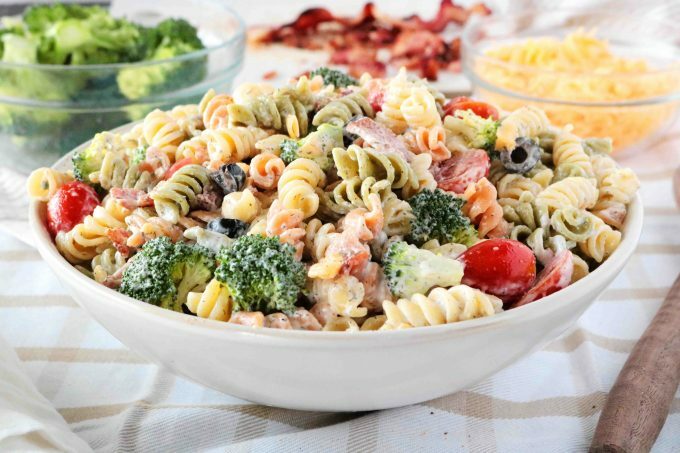 Bacon Ranch Pasta Salad features rotini pasta, crispy bacon, cheddar, broccoli, and more, coated in perfectly creamy Ranch dressing! Place a large pan over medium-high heat and bring to temperature. Add the bacon and cook 6-8 minutes (or until crispy), flipping the bacon about half-way through. Transfer to a plate lined with a paper towel, and once cool enough to handle, chop into bits. Set aside until ready to use. Bring a large pot of generously salted water to a roaring boil. Cook according to package instructions and drain well. Rinse lightly under cool running water until no longer steaming. 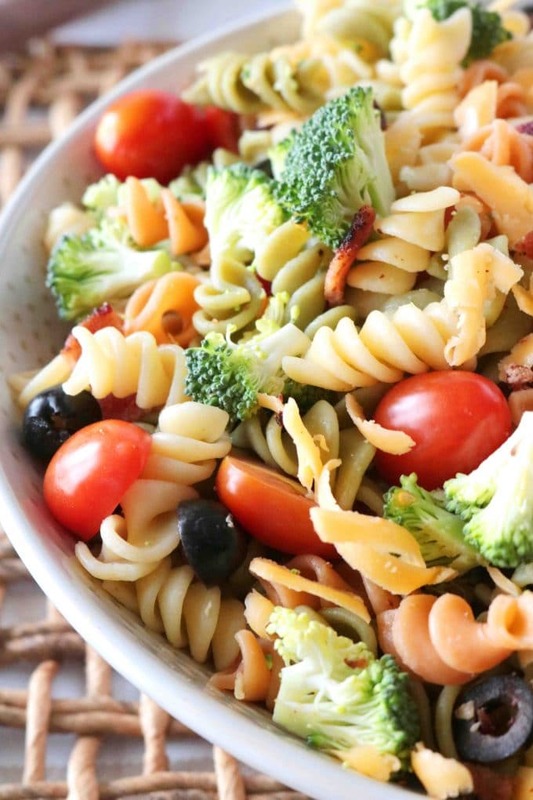 Transfer the pasta to a large bowl, along with broccoli, tomatoes, olives, Cheddar, and bacon. Dress with about half of the Ranch dressing and stir. Refrigerate until chilled, 2-3 hours. Just before serving the pasta salad, stir in the remaining dressing, serve and enjoy! 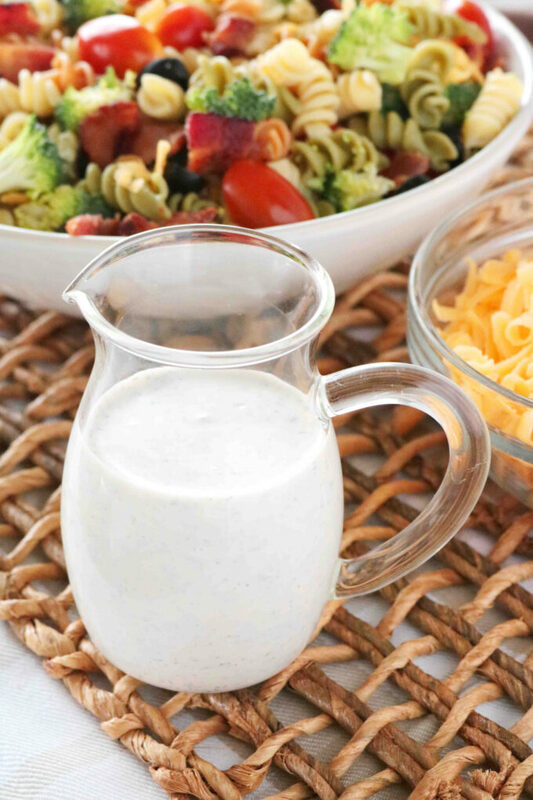 Easy homemade ranch dressing for pasta salad! Combine all of the ingredients in a bowl and refrigerate until ready to use. If not making the dressing completely from scratch, have ready just over a 1 cup of prepared ranch dressing or store-bought ranch dressing. 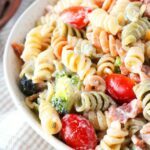 It’s already starting to feel like Spring here and I’m itching for a nice picnic with a delicious pasta salad like this one! This looks like a seriously delicious pasta salad! Bacon and Ranch were totally a match made in heaven! I can’t wait to give this a try! Any salad with bacon is a winner in my books! This looks so fresh and creamy! What a colorful meal and the ranch dressing sounds delish!